I love stockings. They are about a hundred times better than pantyhose in terms of look, feel, and cost (when one legs gets a run, you don't have to throw out both legs!). When it comes to seamed vs seamless I would always choose seamed. 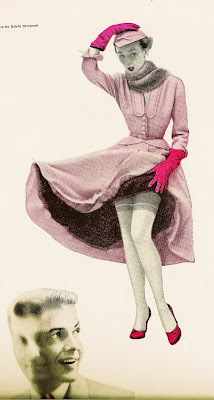 The only problem is that around here real seamed stocking are nearly impossible to find! When I do find some (either in store or online) they are at least $20! Being a university student means that at the moment I have very very little money (stupid tuition...) so spending that kind of money on something I can only wear a few times is not an option. For daily wear I have some seamless stockings I buy at the Bay for $4 or less. I suppose I could always draw seams on with eyeliner like some ladies did in WW2, but I would worry about getting eyeliner on my dress! Instead I have come up with a simple method to create the look of seamed stockings. 1) Do a trial pair! Buy a cheap pair of pantyhose at the dollar store (or use an old pair of stockings) to practise on. It is very likely there will be some areas on your machine that will snag the fabric. Make note of these areas. 2) Thread your machine with a thread that is the same colour as your stockings. Now tape over the areas of your machine that snag the material with scotch tape. 3) Turn your stockings inside out and iron a crease where you would like your line to be. Use the coolest setting on your iron so you don't melt the material. 4) Set your machine to the zig-zag stitch. I used a width of about 2.5 and a length of 2. 5) Start sewing along your crease, starting from the top of the stocking. You should be so close to the edge of the material that on part of the zig-zag the needle is no longer touching the material. Do this very carefully and very slowly. If you don't sew your seams straight they will never be straight when you wear them! 6) End the seam about an inch before the toes. Cut off any excess thread and turn right side out. Tada! 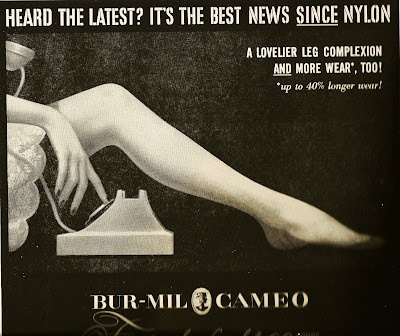 You now have your very own pair of seamed stockings! I'm feeling a little under the weather this weekend so my DIY steamed stocking tutorial is going to have to wait. 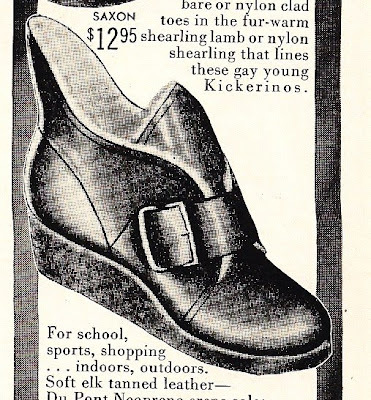 In the mean time, I thought I would share these fabulous vintage boots with you. 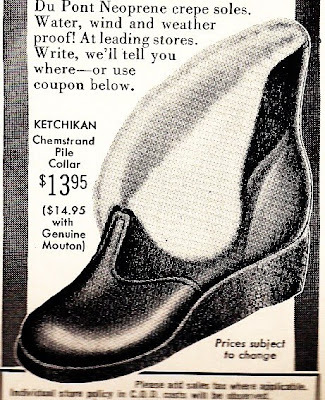 The ad dates from 1951. I have searched and searched trying to find a modern equivalent in stores but so far no luck. If anyone sees a pair (only faux fur please!) let me know! 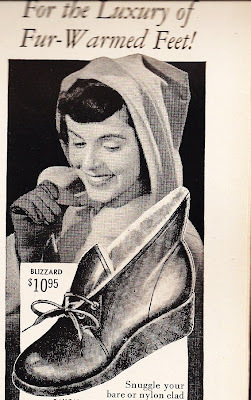 There always seems to be such an emphasis on high heels, so it's nice to know there were also practical shoes around in the 1950's. Hopefully I will be feeling better in the next day or two and can gather pictures for a couple posts I have planned. I hope everyone is having a lovely weekend and a great Family Day (for those of us in Canada)! 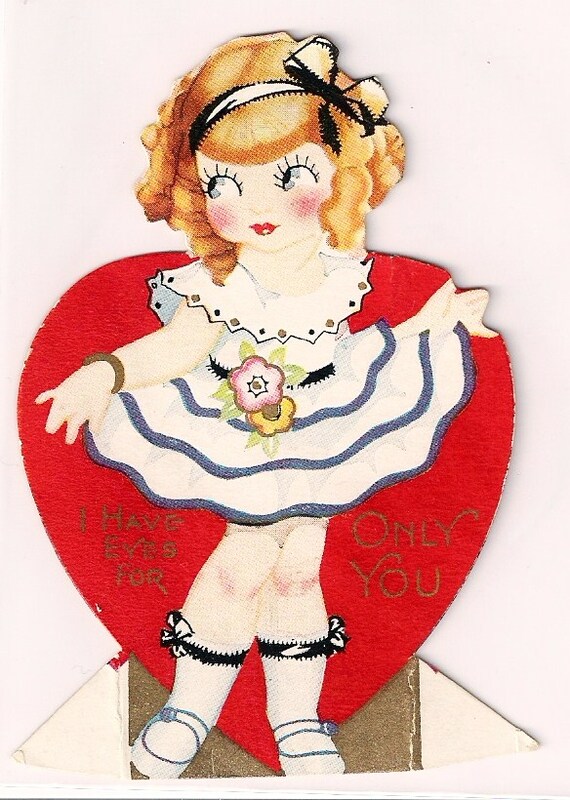 This little Valentine was originally given to "Phillis Sweet"
Just a quick little post to wish everyone a Happy Valentines Day!!! 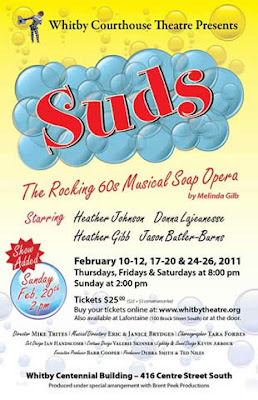 On Saturday night, I went with my parents to see a local theatre production of Suds. It is a musical set in the 1960's about a girl who works in a laundry mat. She is having troubles finding the right man so two guardian angels come to help her out. To be honest I didn't expect much from a small theatre musical, especially since most of the people who produce these plays are volunteers. However, the stars of the production were excellent and all had lovely voices (one of the actresses was actually Donna Lajeunesse, who was a finalist on How Do You Solve a Problem Like Maria?(Canada)). I very pleasantly surprised by the quality of the production. Most people at the theatre were casually dressed, but I always think you should get dressed up for a night out so I wore one of the 1950's dresses I got for Christmas. I had to throw a little sweater over-top since it is still freezing outside. I bought this cute vintage powder container since I needed something to hold my cornstarch (which I use as face powder). Ok yes, still having problems with this need vs. want thing but I'm working on it! I haven't done an outfit post for a while since it has been too cold to wear any cute outfits. Sweaters and trousers are nice but they don't make for very exciting posts. But today after months of knitting I finished my skirt. It took me a while since I could never find time to knit, but since I have started to knit after dinner and at night in front of the TV I have gotten a lot done! On the back of my door I have re-purposed a broken embroidery hoop and some clothes pegs to create an "inspiration board". 1930's hats make any space beautiful. I use a thrifted silver tray and a piece of vintage fabric to decorate my folding wall table. Ribbon storage and antique postcard display. This "side table" is actually a small stool with a box and a tray on top. I store most of my knitting supplies in the box. I love this trunk for storing fabric and materials for sewing projects. I would just like to give a big thank you to Betty2Tone Vintage for giving me a Stylish Blogger Award. Since I just did this one a few posts back I won't bore you with more facts about myself. But thank you!